The world needs to understand the effort by the Left to unseat the duly elected President of the United States, especially when he is doing so much that is good and righteous to make America and the world a better place. It is of paramount importance that people know and understand both sides of the story to fully comprehend the implications and actions that must be taken. This is a tale of two investigations into opposing political parties colluding with foreign agents involving Russia to alter the 2016 U.S. Presidential Election by the commission of campaign fraud and election rigging. Democrats – Trump colluded with Russia to hack the election and steal the presidency. Republicans – Hillary colluded with a foreign agent to spread a phony slander of Trump to convince Obama to enlist the FISC to spy on the Trump campaign. Russian collusion investigation: Mueller has been investigating Trump for a year and come up with bupkis. In his witch hunt he cannot find any kind of crime with which to charge Trump, so has endeavored to claim he has been obstructing the investigation and thus is guilty of Obstruction of Justice. You cannot obstruct justice of a non-existent crime. Instead Mueller has fallaciously charged Trump supporters with crimes. FISA Warrant investigation: Democrats created a fictional document they called the “Trump Dossier” of Trump having Russia prostitutes pee on the bed slept in by the Obamas. This is not the act of a man of power like Trump, but of an impotent bumpkin like the phony Obama. It is now known as the Steele Dossier since it was his fictional story alone that was used to obtain a FISA warrant to spy on the Trump campaign in violation of the law. This corruption of the court meant to protect Americans from terrorists is proof of the deepest Democrat corruption in America’s government. Rep. Nunes has officially exposed Democrat’s scheme that the Left has been slandering the Right over as being a “whacko conspiracy theory,” but now proves to be the tip of the iceberg of the worst crime in presidential history. Democrats say this is all a smoke screen to obscure Trump’s Russian collusion to steal the election. It has been made clear that the Russian charge has been Obama’s and Hillary’s smoke screen to distract from their crime using American intelligence agencies to spy on Trump. President Trump can now ignore Mueller and set him aside and launch a full investigation into the treasonous crimes of Hillary Clinton and Barack Obama attempting to steal the election. Rosenstein and Mueller are investigating a phony crime to cover up the fraud perpetrated by Hillary and Obama. The constitutional crisis will be if President Trump does not prosecute this crime. There was a crime of collusion committed in the 2016 election process, but it was all by Democrats. Democrats use Super Delegates to override the people’s primary choice. Hillary shafts Bernie Sanders to steal the nomination illegitimately. Hillary hires foreign agent to craft phony dossier depicting Trump as a perv. Obama obtains FISA warrants to spy on the Trump campaign. DNC claimed Russia hacked their servers. Moslem IT guys discovered to be the perps. Election night Democrats attempt and fail to stuff ballot boxes enough. Liberals attempt to coerce Electors to violate their votes. Leftists launch the “Resistance Movement” through Antifa Nazis. Liberals invoke 25th Amendment to slander Trump as mentally unfit. Democrats invent the Russian collusion fraud to delegitimize Trump. Leftists try to create Obstruction charges since their collusion is a fraud. 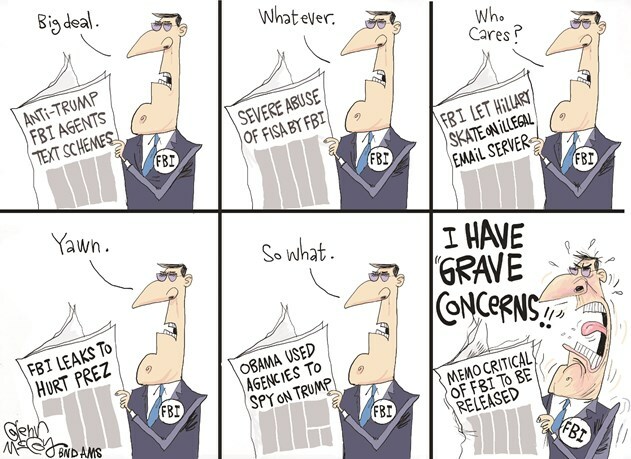 The Left charges the Right as conspiracy theorists in an attempt to distract from and cover-up the crimes of Obama in Hillary in spying on Trump. This entry was posted in Politics and tagged 2016 Election Tampering, Adam Schiff, Democrat Election Fraud, Devon Nunes, DoJ Corruption, Donald Trump, Election fraud, FBI Corruption, Mueller Investigation, Nunes Memo, Obama Hillary Campaign Spying, Russian Collusion, Trump FISA Warrant spying. Bookmark the permalink.